Earlier today, the State Water Board released the draft final documents for the Bay Delta Plan update for the Lower San Joaquin River and southern Delta, as well as a framework document for Sacramento River and Delta. 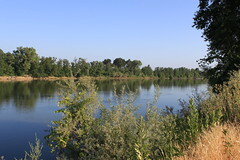 Both the final documents for the San Joaquin River as well as the framework document for the Sacramento River and Delta are calling for more water to be left in the rivers during key times of the year. “California’s agricultural industry suffered another blow today when the State Water Resources Control Board released the Bay-Delta Water Quality Control Plan’s Supplemental Environmental Document (SED). Details in the SED confirm that the Water Board’s Plan will leave thousands of acres of farmland with zero surface supply in certain water year types, stripping the Central Valley of over 6,500 jobs and $1.6 billion in economic output. “Despite dozens of meetings, testimony from experts representing public water agencies, cities, farms, school districts and more, as well as mounting scientific proof that their approach is wrong, the State Water Board has not budged an inch, said Mike Wade, executive director of the California Farm Water Coalition. “The State Water Board’s unimpaired flow strategy does nothing to address major stressors in the system, such as the loss of habitat for native species and overwhelming predators that have gained a problematic foothold on the Delta. What is needed, instead, are functional flows, which can meet multiple needs from farming to habitat protection, recreation, and urban water supply needs. “This sort of unresponsive bureaucracy is extremely frustrating for people at the local level who are committed to viable environmental restoration activities, said Wade. Simply dumping more water down the river with the hope that it will solve the Delta’s water issues is an incomplete solution to a complex set of problems. “Californians are being asked to make good water management a way of life. We are being asked to be adaptive and seek flexible, creative approaches to how we use water at home, at our jobs, and on our farms. We are being asked to be reasonable with the water we use, to be good stewards, to avoid waste, and to limit our water use to what is reasonably required. “Californians have risen to those challenges and we should expect no less of California’s State Water Resources Control Board,” he said. The State Resources Control Board’s Bay-Delta plan would mandate 40 percent of unimpaired flows along the Stanislaus, Tuolumne and Merced Rivers from February 1 to June 30 annually under the guise of improving river conditions for salmon. However, it blindly follows the more flow equals more fish mantra while failing to recognize the true threats to endangered fish in our rivers –predation and inadequate habitat restoration. These are two issues our local community and Irrigation Districts are working to actually address. Congressman Denham strongly supports the Tuolumne River Management Plan developed by Turlock and Modesto Irrigation Districts as a science-based plan that will meet the state’s ecological development goals without sacrificing our Central Valley water. The plan was constructed using the latest science conducted on the Toulumne as part of the federal relicensing of the Don Pedro Hydropower Project and maintains water supply reliability for agriculture and urban users, identifies measures to protect fish populations and supports new recreational opportunities. Rep. Denham will continue to advocate for this practical and effective plan to restore our rivers and reject agenda-driven policies pushed by Sacramento bureaucrats. For more information about what Rep. Denham is doing to fight for water in the Valley, visit www.Denham.house.gov/water, where you can also sign up to receive periodic updates on his work in Washington to improve local water infrastructure, storage and delivery. “No one can deny we’ve heavily damaged the natural function and benefits of the rivers by over-diversion. Salmon runs in the three major San Joaquin River tributaries have fallen from 70,000 in 1984 to 8,000 in 2014. This has hurt fishing families and coastal communities. Assemblymember Adam C. Gray (D-Merced) released the following statement condemning today’s announcement from the State Water Resources Control Board to ignore decade’s worth of science and public opinion by adopting radical new requirements to seize and waste critically needed San Joaquin Valley water supplies. “The State Water Resources Control Board’s decision today is the first shot fired in the next chapter of California’s water wars. The board has chosen to create, in their own words, ‘a permanent regulatory drought’ and shrugged off our concerns as ‘significant but unavoidable’. This is what theft looks like. A small group of special interests have spent years plotting one of the largest water takes in our state’s history. They attempted and failed to change the law and win in court, so instead they have infiltrated government itself. They positioned their allies to influence the process from within and spent hundreds of millions of dollars of taxpayer money to prop up their house of cards. Despite entire agencies at their disposal and seemingly unlimited funds, no amount of trickery can obscure the truth – their fish first philosophy will decimate our region, poison our drinking water, and provide no environmental benefit what-so-ever. “The Merced Irrigation District strongly condemned the revised, final Bay Delta water plan released on Friday, calling it an irresponsible water grab that would place undue harm on already significantly disadvantaged communities. “The District has maintained for years that simply diverting senior water rights away from our community for the benefit of others solves nothing. It devastates one of the most disadvantaged regions of the state and does nothing to benefit salmon or other wildlife,” said MID General Manager John Sweigard. MID has continued to advocate its proposed alternative to the state’s water grab: The Merced River S.A.F.E. Plan (Salmon, Agriculture, Flows and Environment). The plan represents a comprehensive alternative proposal aimed directly at supporting sustainable agriculture, fisheries and the environment. Continue reading at the Sierra Sun Times by clicking here. Despite having well over a year to adequately address thousands of public comments from our region – 6,589 from the Worth Your Fight campaign alone – the State Water Resources Control Board today doubled down on its proposal to mandate 40 percent of unimpaired flows along the Tuolumne River from February 1 to June 30 annually. The State Water Board thinks this plan will have limited harmful effects. But we know this water grab will have devastating impacts to our region, which is why thousands showed up and voiced frustrations when the State Water Board came to our communities. In March 2017, MID and TID filed joint comments addressing a number of technical and legal issues surrounding the State Water Board’s proposal. The comments also reference the most recent, most focused and most collaborative Tuolumne River science that has been conducted through the relicensing of the Don Pedro Project. We are disappointed, but unfortunately not surprised, that State Water Board staff decided to ignore these site-specific, peer-reviewed studies. Apparently after a year of review and edits, the State Water Board feels it only needs to give our region 21 days to review and comment on the latest draft. The Districts are joining other water agencies to petition the State Water Board to give us more time to comment on this proposal that will drastically impact our communities. Comments will be accepted by the State Water Board through noon on Friday, July 27, 2018. The State Water Board has scheduled a hearing to take place at its Aug. 21-22 Board meeting in Sacramento. More information about the hearing day will be shared on Worth Your Fight’s Twitter and Facebook feeds as details develop. In the time since MID and TID filed comments on the State Water Board’s Substitute Environmental Document (SED), the Districts have proposed the Tuolumne River Management Plan; a balanced, sustainable, achievable future for the River. Our plan describes a future that maintains water supply reliability for ag and urban users, identifies measures to protect fish populations and supports new recreational opportunities. The Tuolumne River Management Plan was informed by the latest site-specific science conducted on the Tuolumne as part of the federal relicensing of the Don Pedro Project. The Districts have the ability to implement programs that will greatly enhance Tuolumne River habitat that can lead to greater fish spawning and production numbers. There are many factors that influence salmon numbers once salmon leave the Tuolumne River that are outside the District’ control – San Joaquin River predation hotspots, Delta predation and ocean harvest, to name a few. The Tuolumne River Management Plan is anticipated to increase fall-run Chinook salmon production in the Tuolumne River over 2½ times the current production. If the State Water Board was actually interested in protecting and improving the natural resources of the lower Tuolumne River they would recognize that the Districts’ flow and non-flow measures would create the conditions for native fisheries to thrive far greater than its flow-centric SED. In response to the SED’s release, the Districts urge the public to follow Worth Your Fight’s Twitter and Facebook feeds as the Districts provide the most updated information regarding how to advocate against this reckless proposal. Advocates can also check out WorthYourFight.org. ” … As the Board recognizes, the Delta is in ecological crisis. The Board’s approach of requiring a percentage of unimpaired flows to remain in the river and Delta is scientifically sound and has repeatedly been peer reviewed, as discussed in more detail below. But the details of the proposal matter, and will determine whether California sustains its native fish and wildlife for future generations. NRDC and our partners will closely review these documents over the coming weeks and months, and we look forward to the State Water Board releasing its environmental review of these proposals and alternatives later this year. Click here to read the full text of Doug Obegi’s remarks.